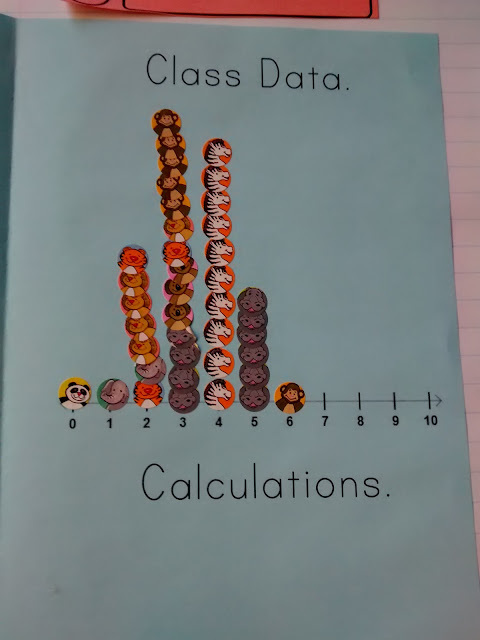 This year, I decided I wanted to start my statistics class off with a statistical simulation to give them a taste of what was in store for the year. I ran across mention of a hiring discrimination simulation on another blog, and I thought it would make the perfect first activity. 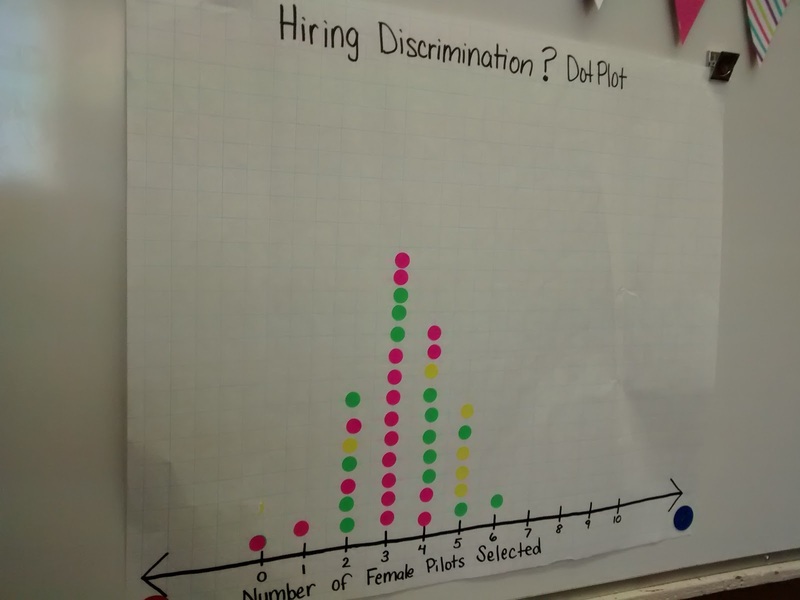 The activity is from The Practice of Statistics. I made the activity into a quick booklet foldable for students to glue into their interactive notebook. Here's some more readable images. Instead of using a deck of playing cards to run the simulation, I decided to make a sheet of pilot cards to print and laminate for each group. I love finding excuses to laminate things! Each group got a bowl of cards to run their simulation. Well, they first had to cut their cards and put them in the bowl. 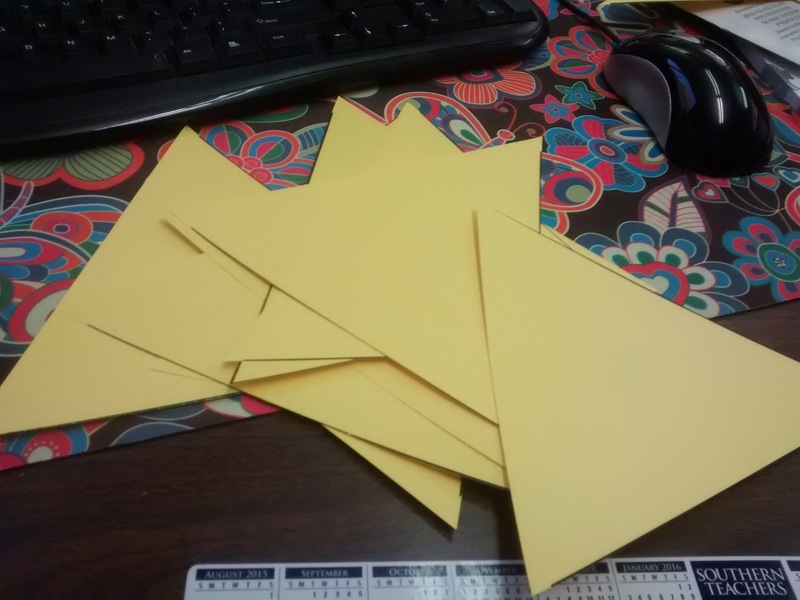 Next time I teach stats, the cards will already be cut, and they'll just get a bowl of cards. 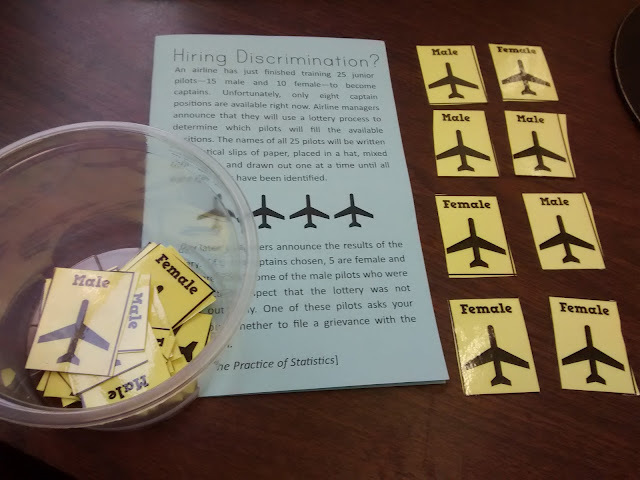 They pulled out eight cards to simulation the random picking of the eight pilots. Students then had to copy the class dotplot into their notes. One girl asked if she could use stickers there, too. Of course! 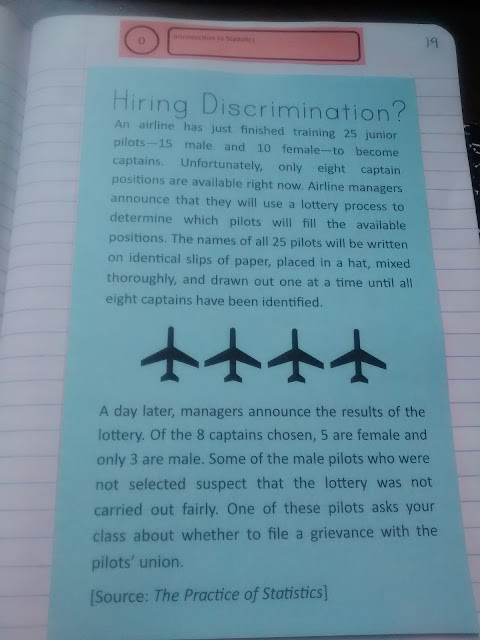 I was a bit disappointed with how little my students wanted to critically think through the scenario to decide if discrimination was present or not. It seemed like they just wanted to guess and not use statistics or math of any sort to back up their hunches. I guess this does mean the activity gave me insight into how my students would likely approach our study of statistics. Getting my students to write out a full sentence with fully explained thinking for the TELL section was difficult. This has proved true for the entire year. My students hate to write and explain. 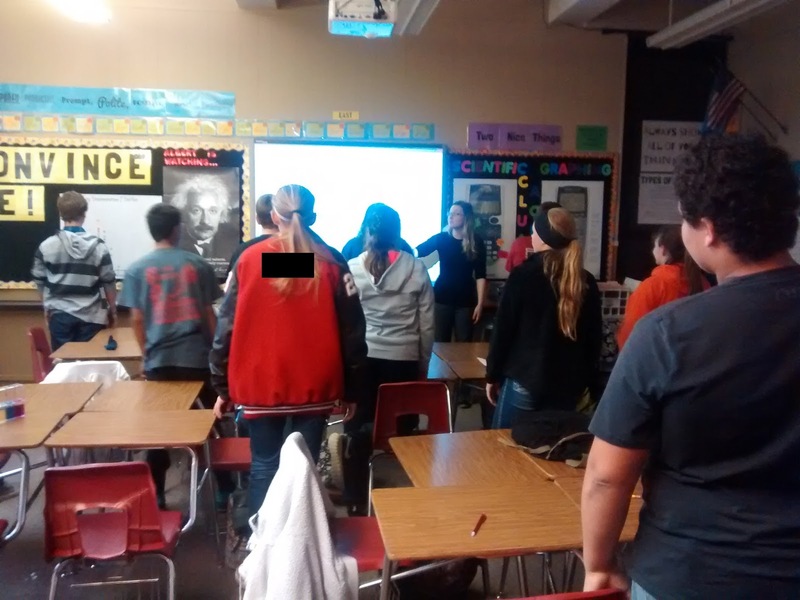 I do think this was a worthwhile activity to start out the year! If you want the files, you can download them here. Sorry my posting has been so sporadic of late. It turns out that teaching, grad school, and wedding planning is waaaaaaaaaaaay more than a full-time job. 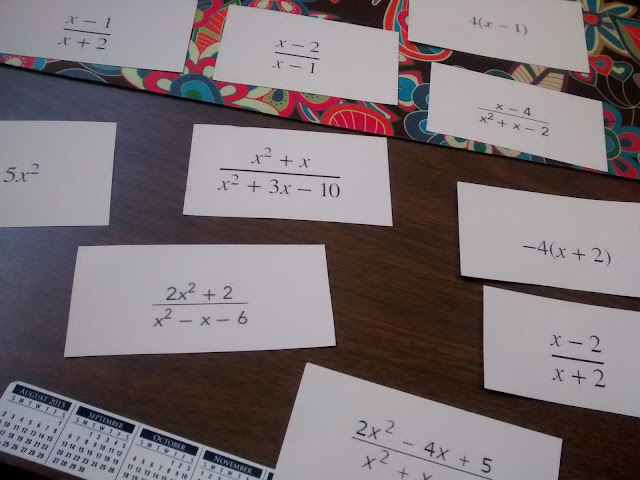 Today, I want to share another self-checking practice activity I made for my Algebra 2 students. It's a Question Stack to practice simplifying and adding/subtracting rational expressions. Lay out all of the cards with the answers facing up. Flip over one card to reveal a question. Find the answer on another card. 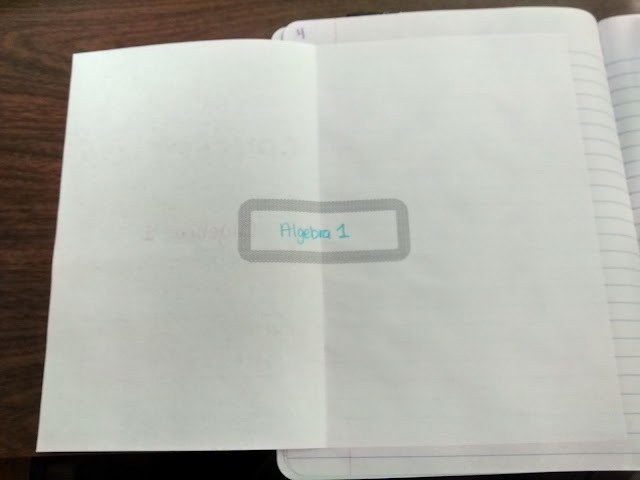 Flip that card over and lay it on top of the first question card to start a stack of questions and answers. Work the new problem that was just revealed. Repeat until you run out of cards. 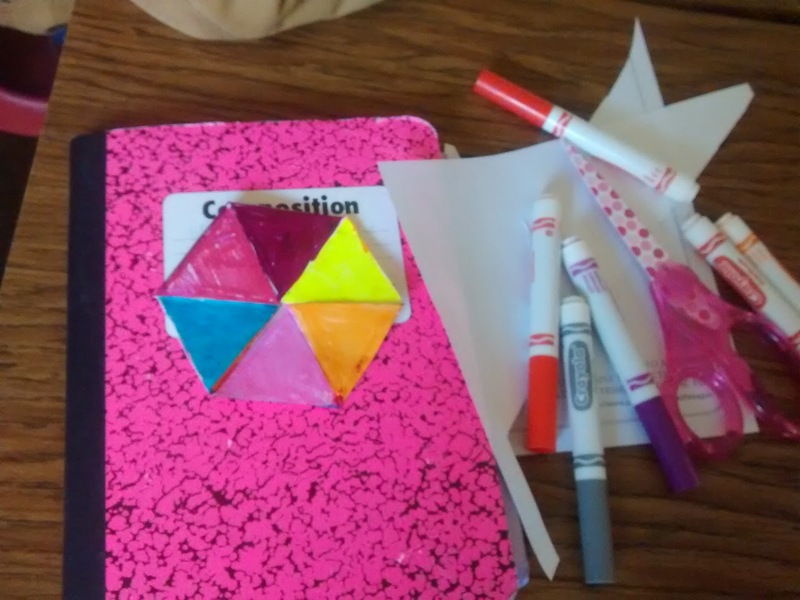 I have my students work through these in groups with mini dry erase boards. This was very hastily put together because 1) I am a procrastinator and 2) I have first hour planning period. That is NOT a good combination. So, if it bothers you that I copied and pasted some questions and typed others, I apologize. If your kids are super astute and will notice the font differences, you should probably fix this. My kids were so stressed out about rationals that they didn't seem to notice. I put a Q on the question side of the cards to avoid confusion. I still had one group waste a lot of time trying to solve a problem. They couldn't figure it out. I couldn't figure out why it wouldn't simplify. Finally, I realized that they were looking at the answer side of the card that was already simplified. The rest of the class gave them a whole lot of grief over that! And, here are the answers. The cards do not print with the question and answer on the same card when printed double sided. This is by design. The cards should form a sort of loop. Download the file (PDF or Publisher) here. 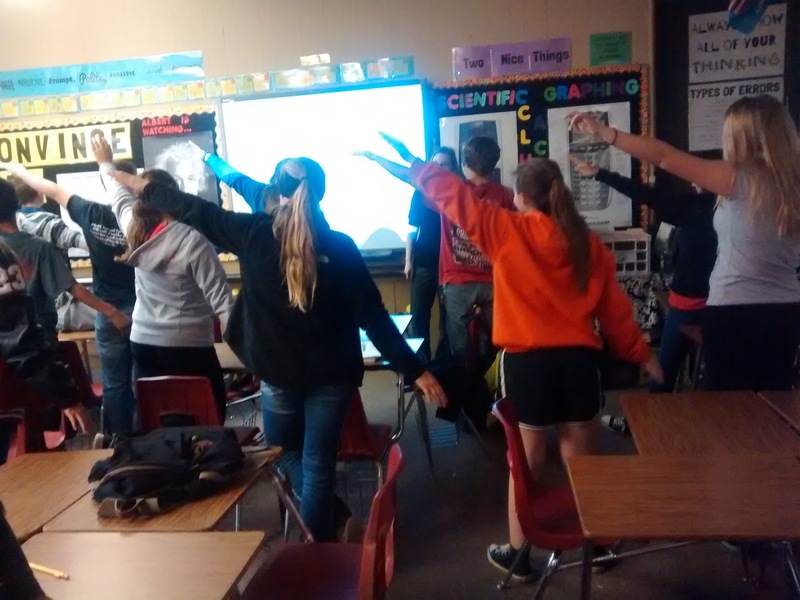 Last week, we got to play one of my favorite algebra games ever: Slope Dude Says. 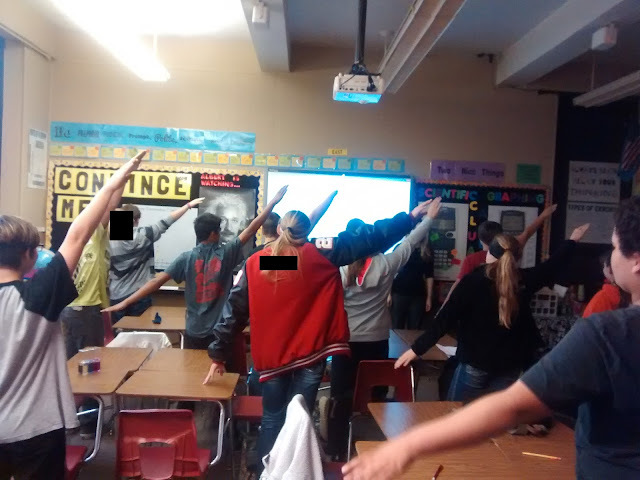 Before playing the game, I had to make sure my students had been introduced to Slope Dude. I told them that we were going to watch my most favorite math video in the whole world. Some students had seen it before, but others hadn't. Here's the link to the video on Youtube. It's only 2 minutes long, and I think it's well worth your time. It's a newer version of the video with improved sound quality and captions. The kids always groan and make fun of it, but I know that they truly love it deep down in their heart. Honestly, I don't really care what they think about the video. I just know that it's hard to forget the four types of slope after watching this! 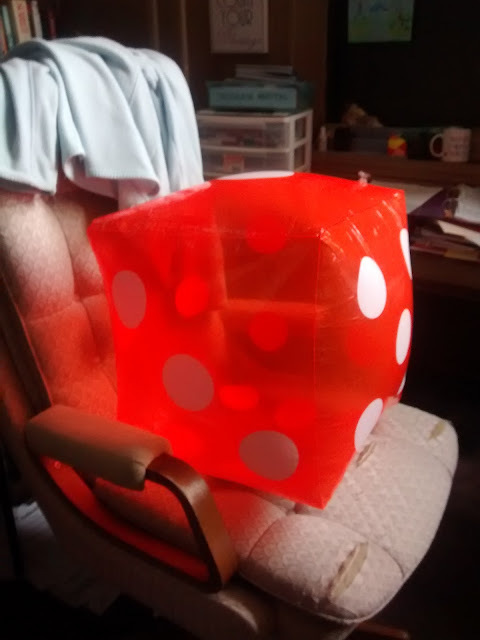 After watching the video, I announced we were going to play a fun game. I put up this slide with the rules. It's just like Simon Says, but kids are asked to make various slope motions. I always demonstrate the different types of slope for my students so they know what to expect with the game. I tell students to pretend they are looking at the graph as they make their motions. When I'm judging them from the front of the room, their positive slopes look like negative slopes and vice versa. Here is a class demonstrating the movements for you. The first round or two, it's really easy to get students out. All I have to do is start the game by saying "Positive Slope!" Usually, a ton of kids will do it even though Slope Dude didn't say. As we play more rounds, it gets harder and harder to get the kids out. 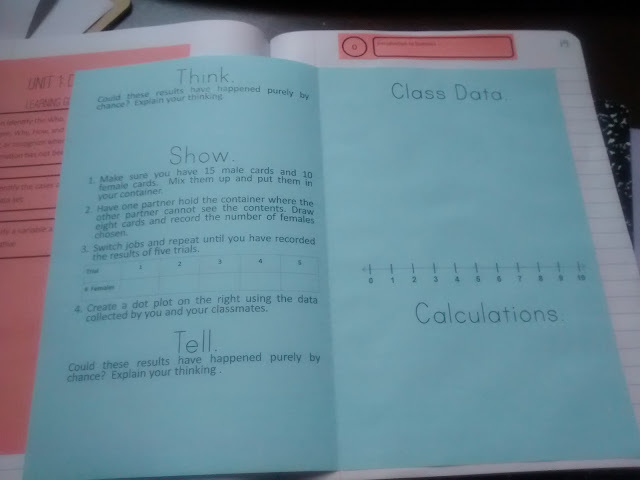 One of my classroom aides was in my Algebra 1 class during my first year of teaching. She even complained that her class never got to play it. I love that I get to keep trying out new ideas every year. 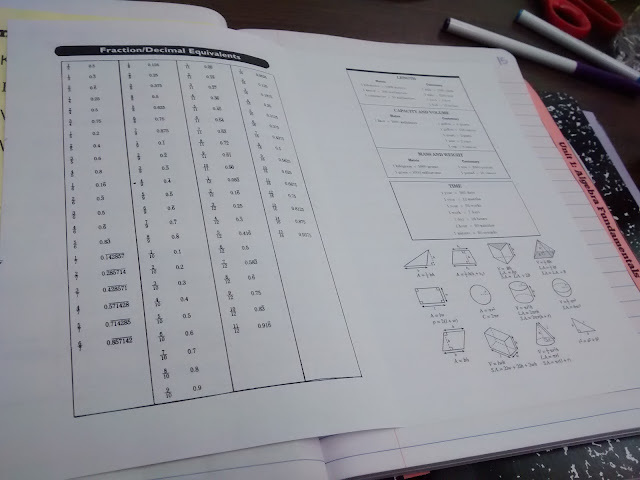 I was once afraid that I would get bored teaching math all day long. It turns out that no two math lessons go the same. And, no two years of teaching are the same. It's all new, all the time. And, I wouldn't have it any other way! 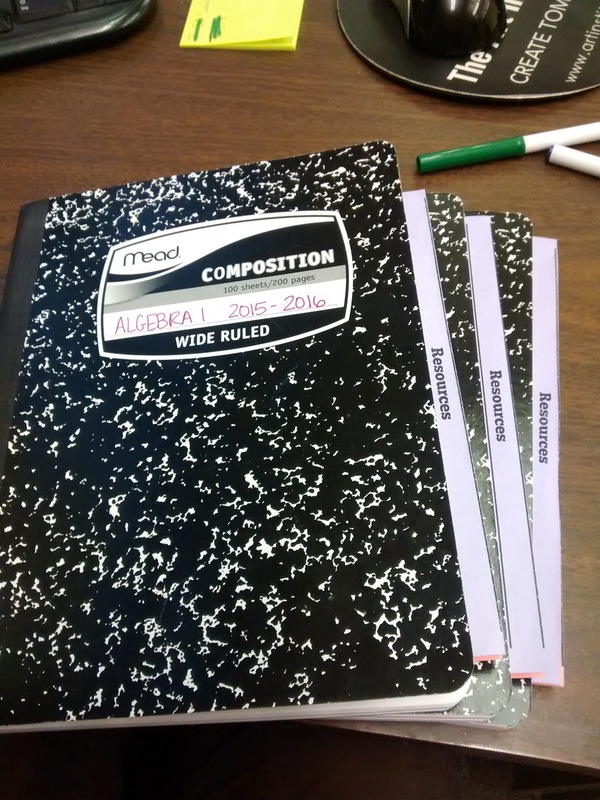 My students set up their interactive notebooks on the third day of school. That was in August. It's November, and I'm finally blogging about it. Here are my three interactive notebooks for the year. Algebra 1, Algebra 2, and Statistics. 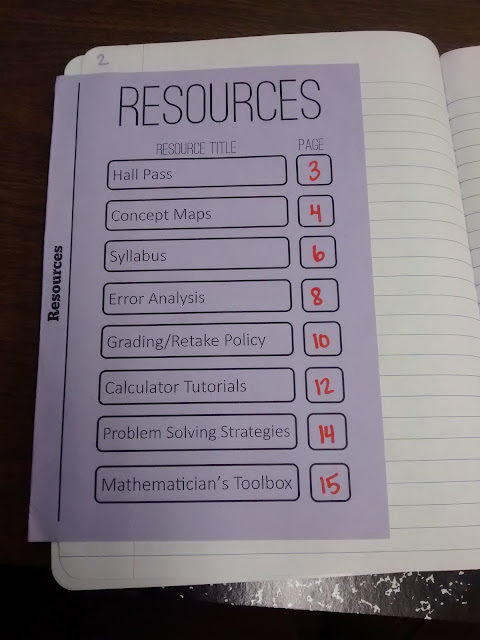 I decided to have the students create a resources tab at the front of their notebook to hold frequently referenced stuff. It starts out with a unit mastery sheet. My Algebra 1 class has 8 units. As students finish each unit, they fill in the box. 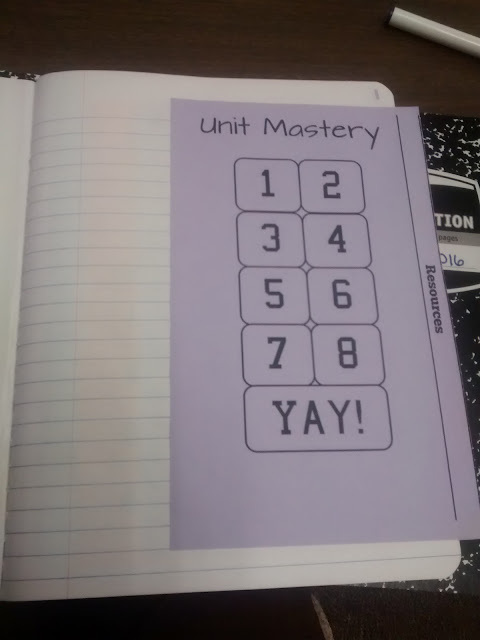 When they are all filled in, they have demonstrated mastery of Algebra 1. The other side of the tab has the table of contents for the resource section. I pre-typed the names of the resources. Students just had to fill in the page numbers. Up next was the hall pass I gave my students. Students are allowed four hall passes per quarter. This has drastically cut down on the number of times students are asking to leave my classroom this year. I'm definitely considering this one a win! Then, I had my students glue in two concept maps. They complete one at the beginning of the year and one at the end of the year. On the inside, they wrote the name of the subject in the center. 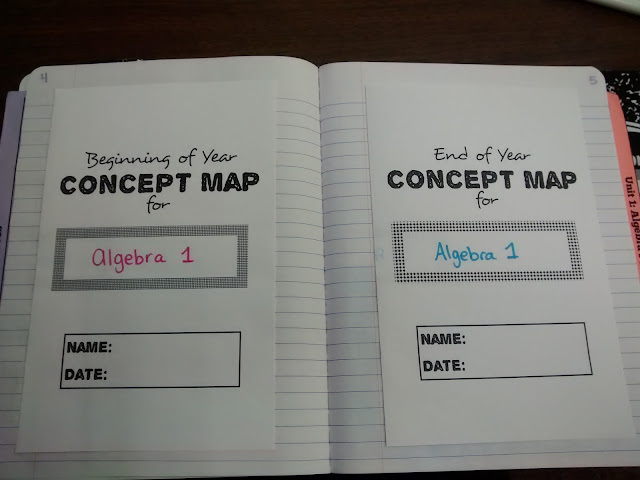 Then, they made a concept map/mind map/bubble map/whatever you want to call it map to summarize what they thought Algebra 1/Algebra 2/or Statistics consisted of. 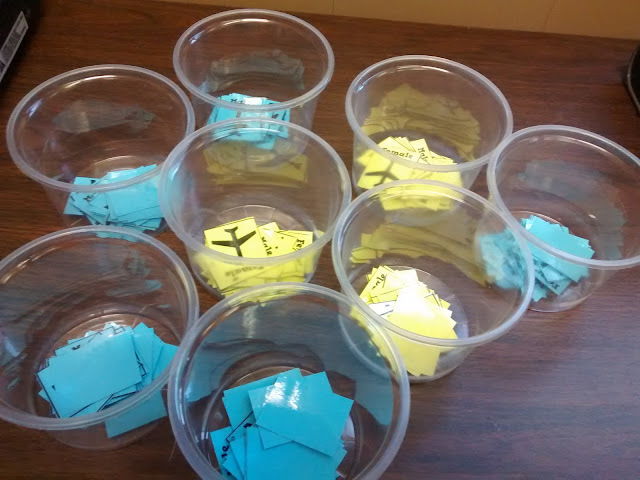 After filling these out, we used stickers to seal them shut until May. In May, we'll do another concept map and then open August's map to compare what they thought the class would be about to what it was actually about. Next, I had my students make a pocket to hold their syllabus. 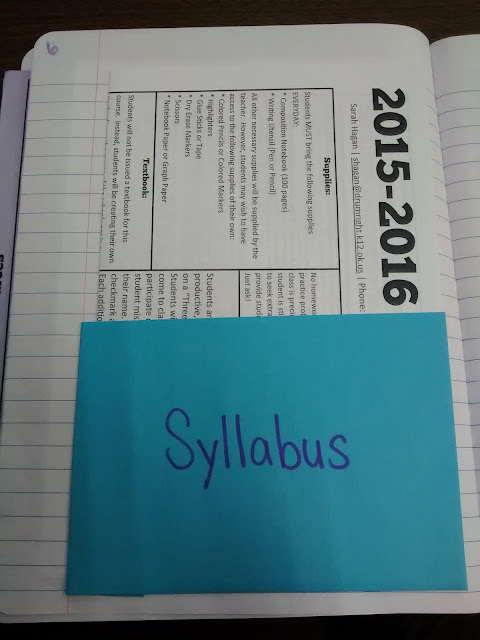 I had students read through their syllabus with a highlighter in hand to highlight the key information. 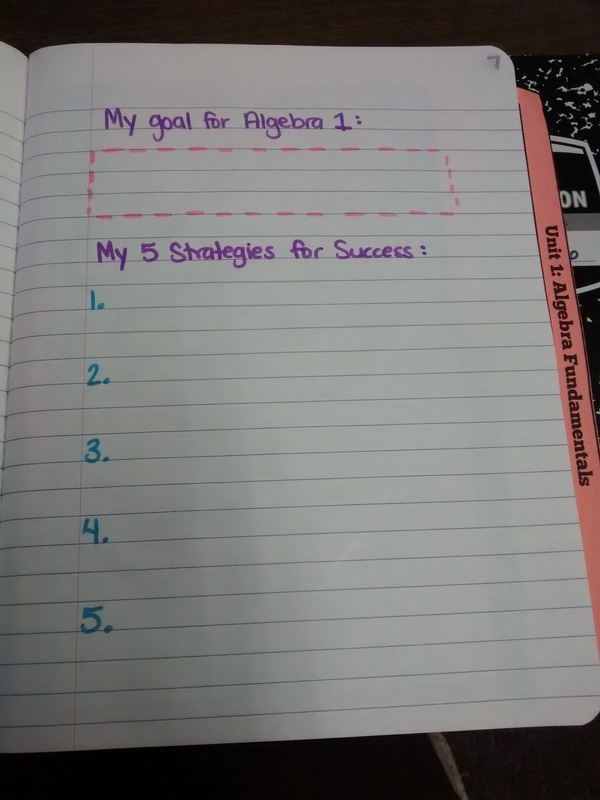 Next to the syllabus, students wrote out their goal for the year and how they planned to achieve that goal. I think I would make a quick graphic organizer for this in the future. 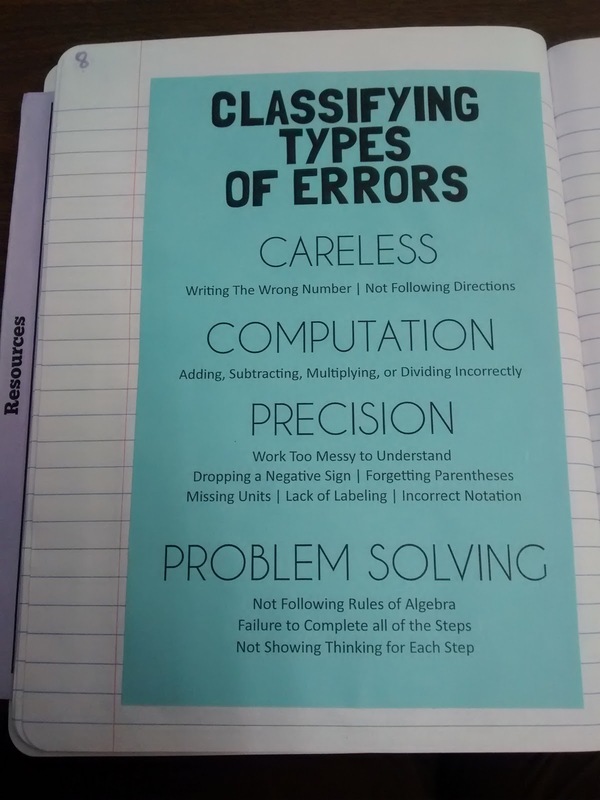 Since they have to analyze all of their errors before retaking quizzes, I gave them a sheet summarizing different types of errors. And, they made a pocket to hold sample error analysis sheets. 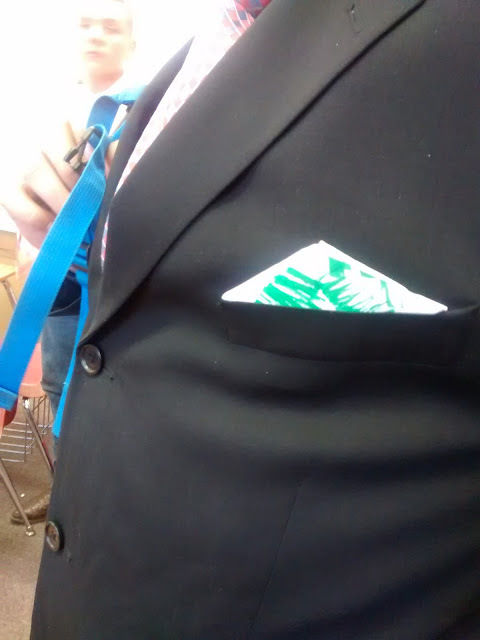 I didn't have my sample sheet in this pocket when I took my picture. Sorry! Basically, I took the first quiz of the year and made up fake answers. 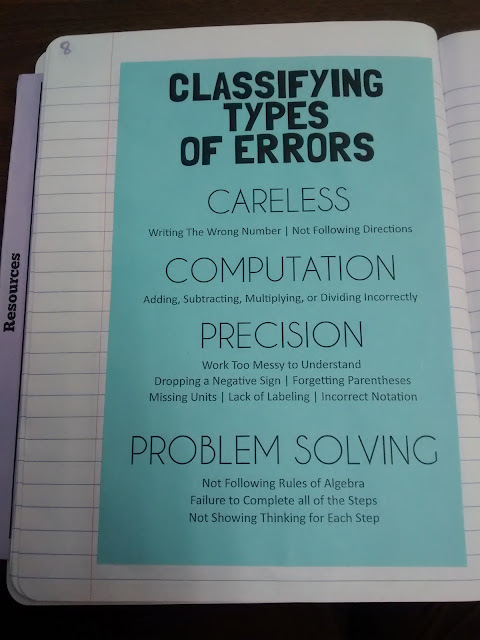 Students had to grade it and fill out an error sheet for the fake quiz. 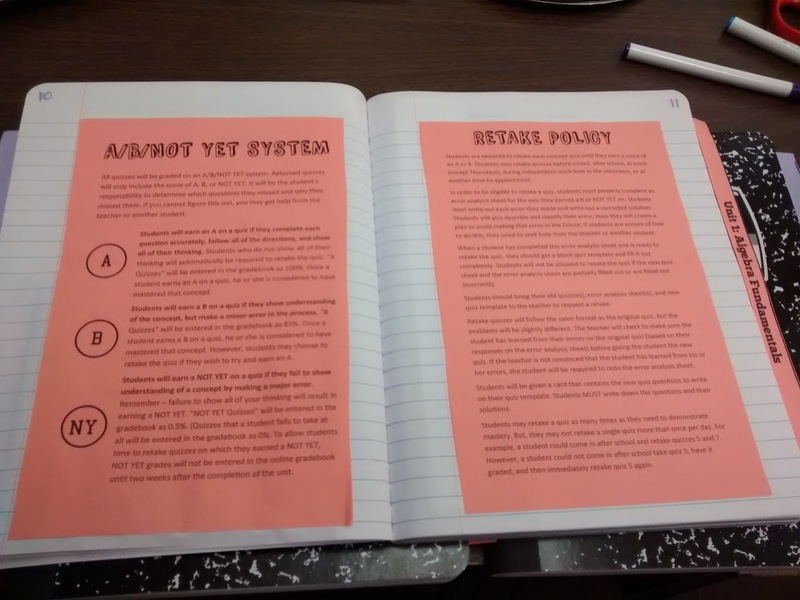 After this, student glued in a summary of the grading and retake policy. 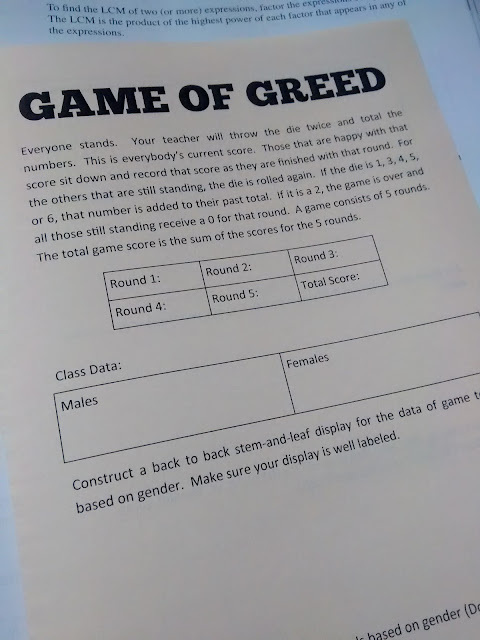 I'm not sure if any students actually ever looked at this. I'd probably leave this out next year. 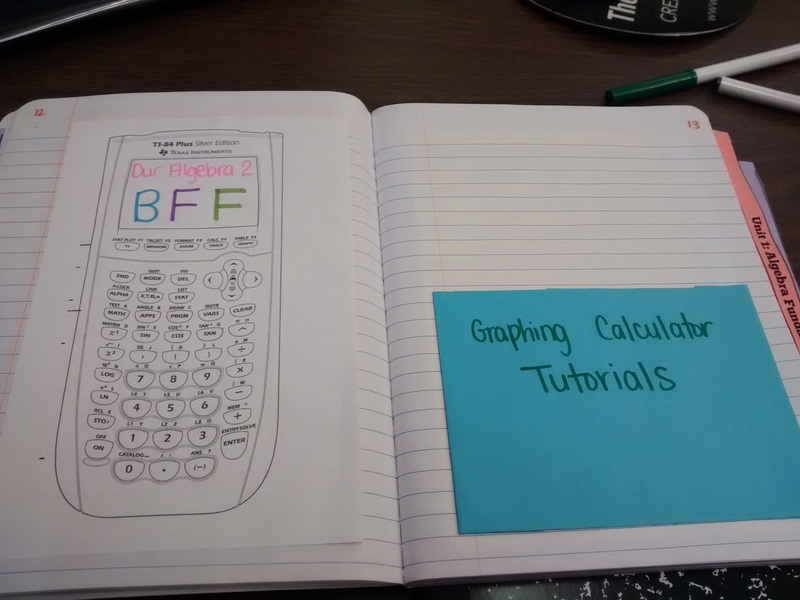 Calculator tutorials came next. 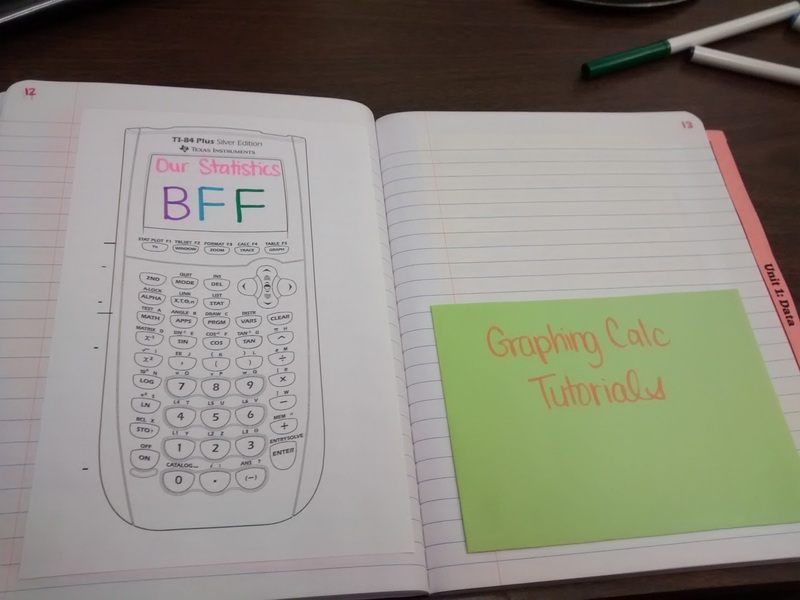 Algebra 2 and Statistics glued in a TI-84. 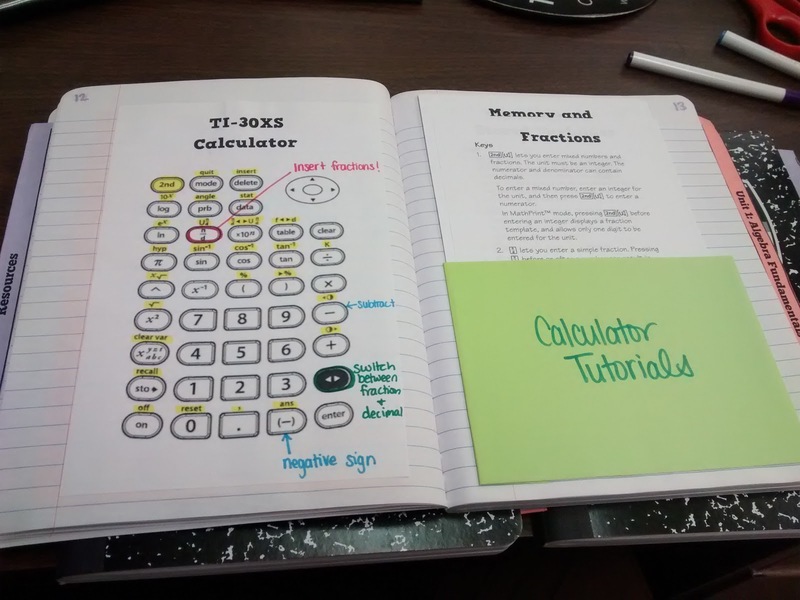 Algebra 1 glued in a TI-30. 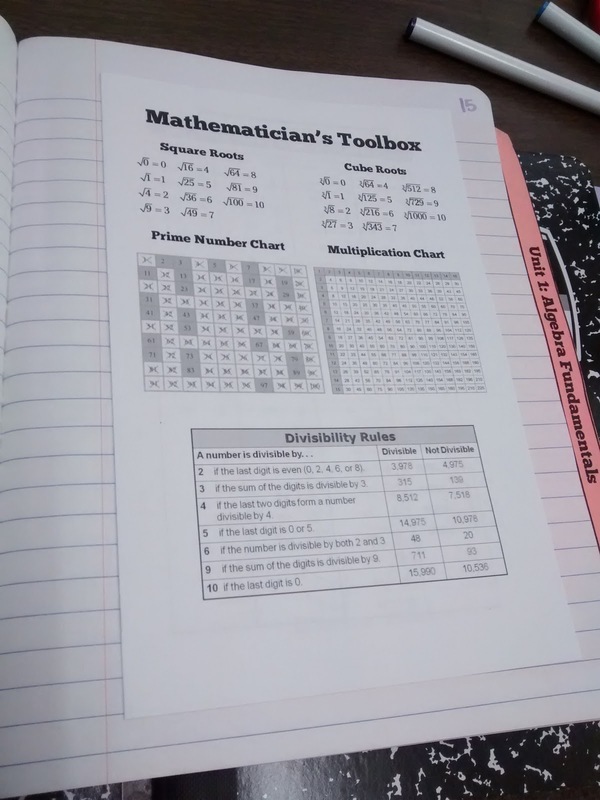 Then, they made a pocket to hold tutorials that will be given out throughout the year. 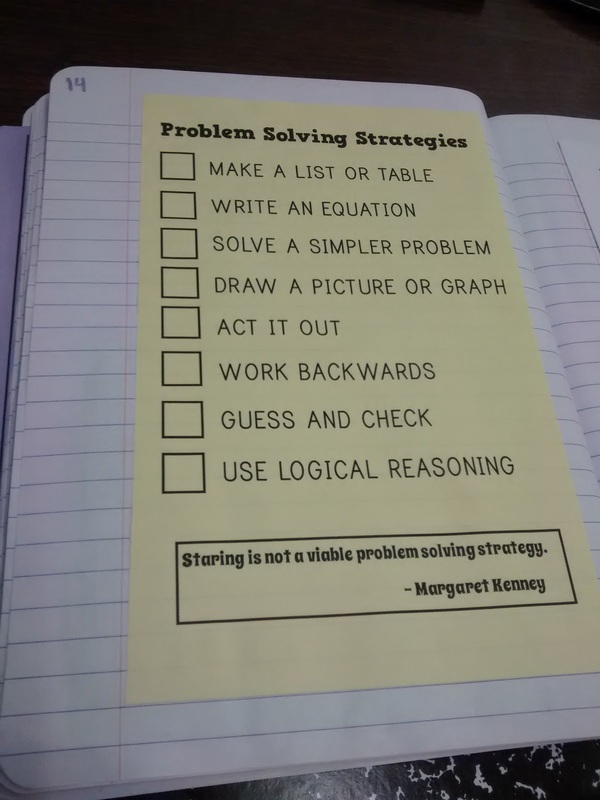 I don't have problem solving strategy posters on my wall this year, but I did give students a list of strategies to glue in their notebooks. They had to design a tiny icon to represent each strategy. It was fun to see how creative my students got. The last thing we glued in our resource section is probably the most used item. I call it our mathematician's toolbox. So far, my Algebra 1 students have referenced the square root chart while rationalizing the denominator. 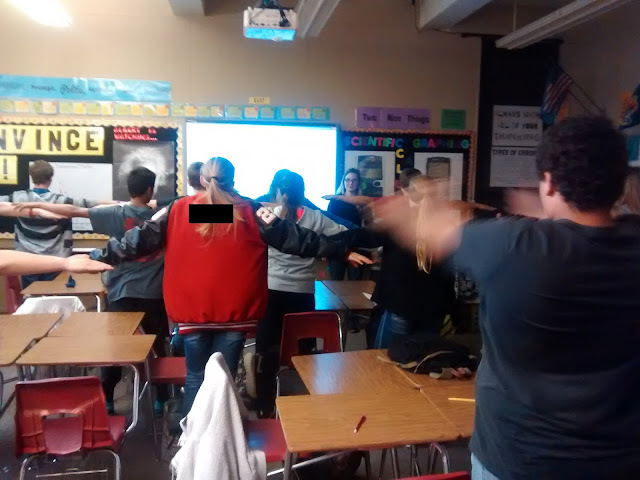 My Algebra 2 students have referenced the prime number chart while working with radicals. 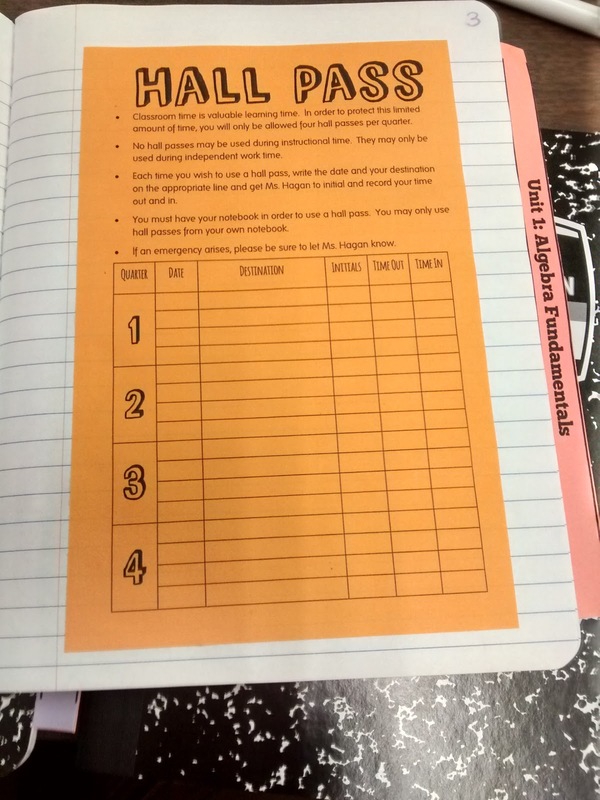 My Algebra 2 students have also used the multiplication chart while working on factoring quadratics. The next day, we glued in our Unit 1 Table of Contents and jumped into the first unit of the year. October 21st was Martin Gardner's birthday. 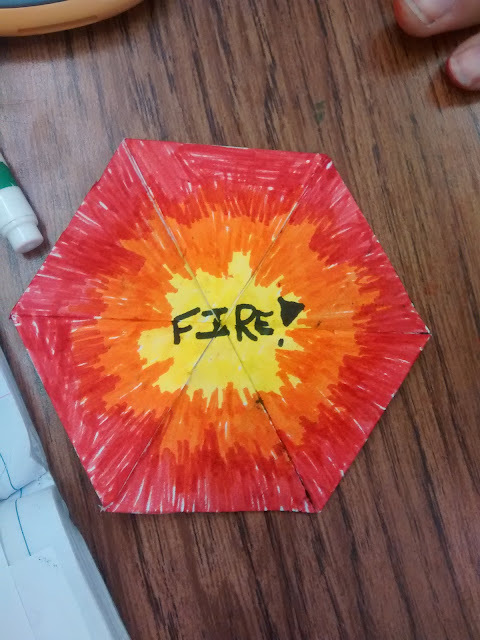 Every year, I have my students make hexaflexagons to celebrate. This year, all of our juniors were taking the ASVAB that day, so classes were already disrupted. 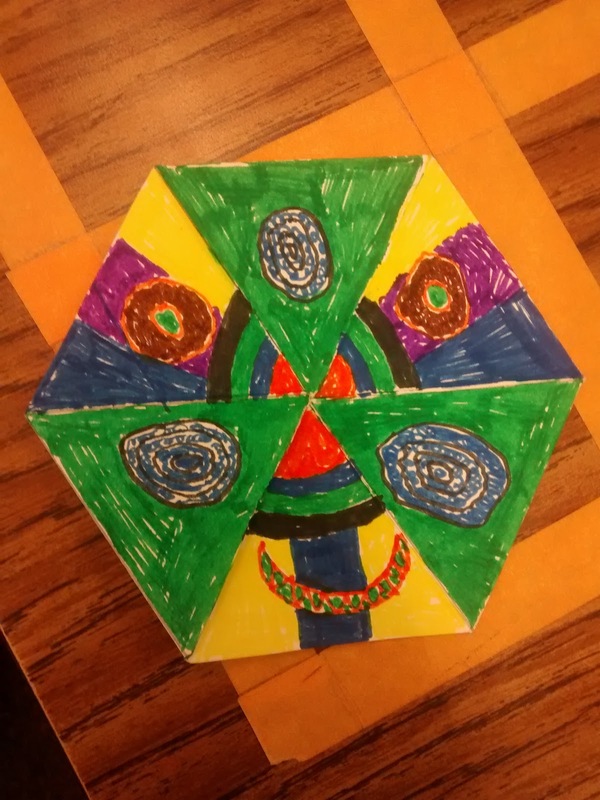 I always feel slightly guilty about skipping out on a day of what could be state-mandated curriculum practice, but I feel like showing kids this creative side of math is important, too. I presented on hexaflexagons at TMC14, and I made a giant hexaflexagon for that presentation. So, that had to come out! 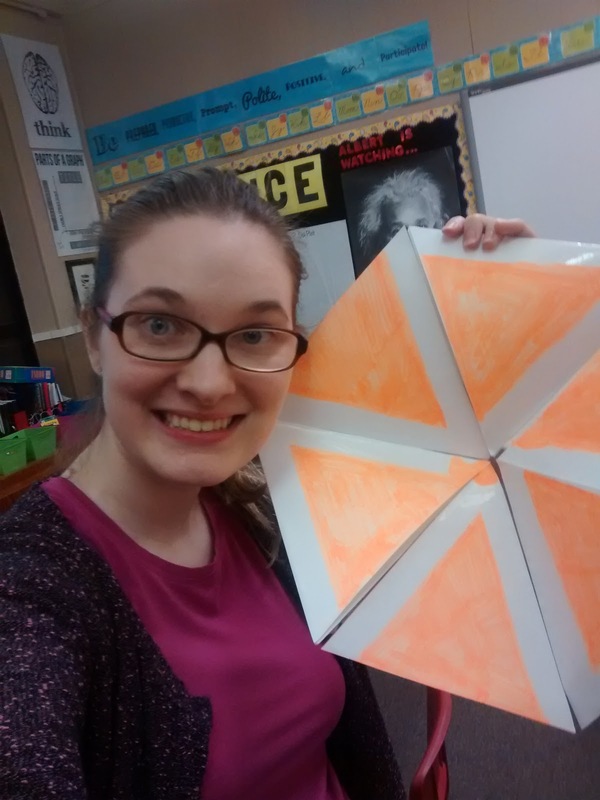 Here's me and my giant hexaflexagon. 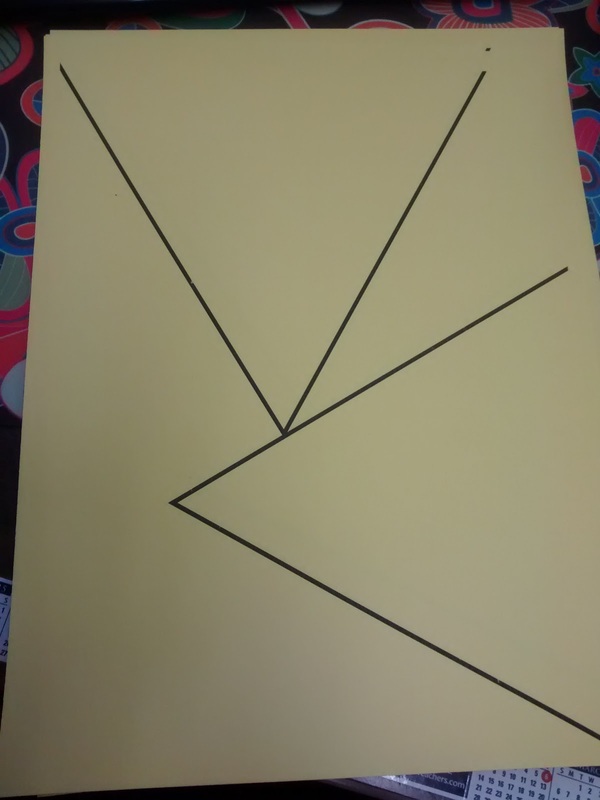 The equilateral triangles have a side length of 8.5 inches. 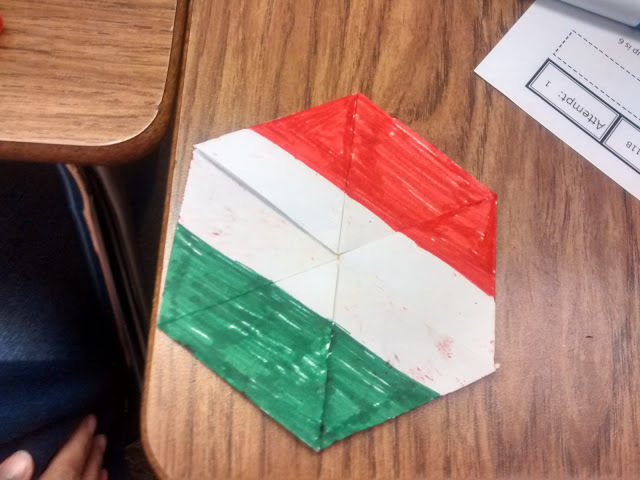 This helped a lot with showing students how to fold the hexaflexagon. I began class with a video of Martin Gardner demonstrating a hexaflexagon. It's a 2 minute excerpt I found on youtube from David Suzuki's 1996 "The Nature of Things" program. Next, I showed them Vi Hart's introduction to hexaflexagons video. After watching this video and commenting about her different colored sleeves and how super fast she talks, we finally set to cutting out and creasing our hexaflexagon template. 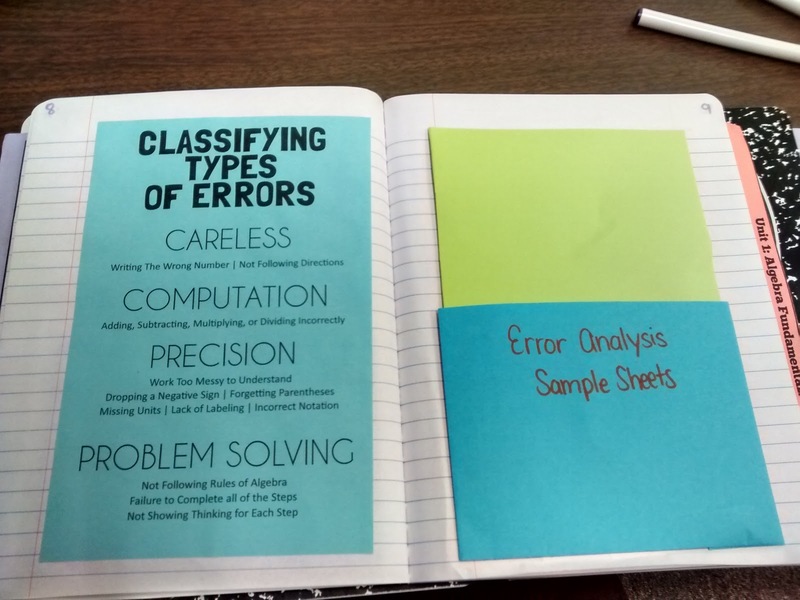 I use this template with my students. 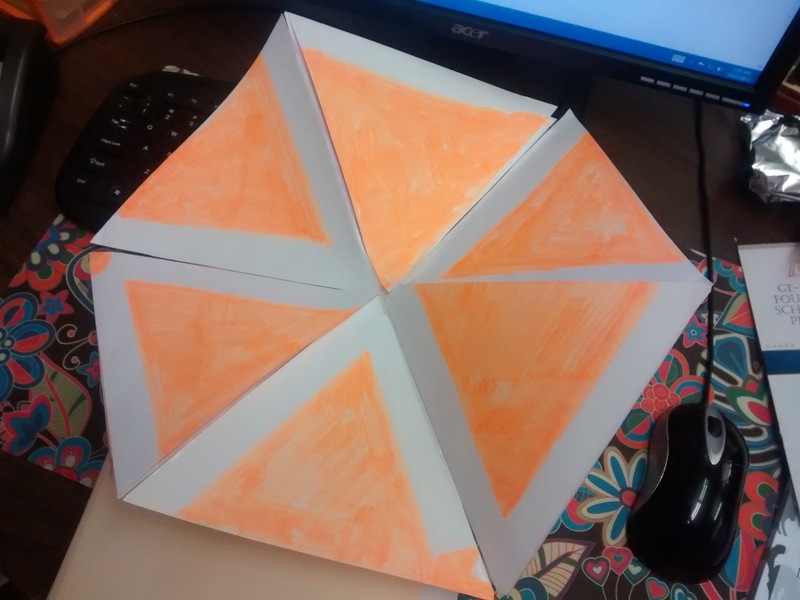 I emphasize to my students that the better your creases are, the better your hexaflexagon will be. If a student gets done double creasing all of the folds before everyone else in the class, I have them go back and crease them again. 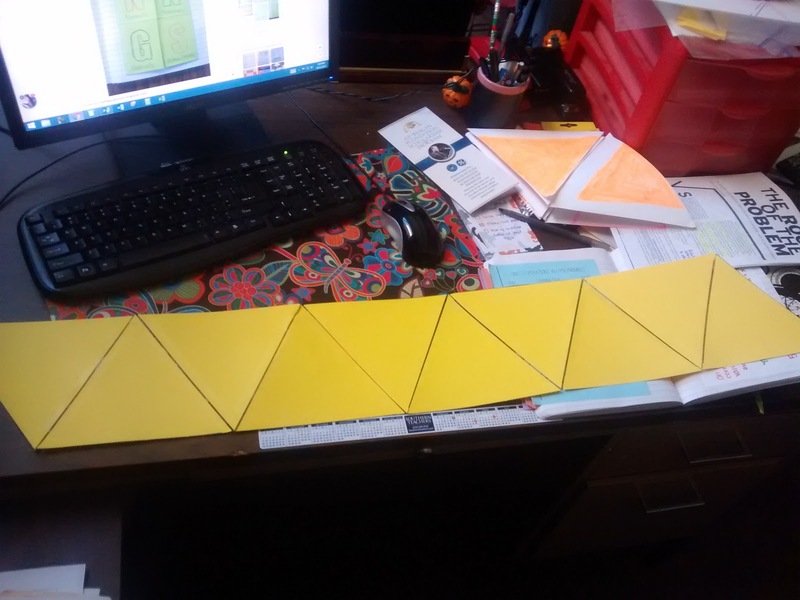 Once everyone is creased and cut and ready to go, I demonstrate folding the hexaflexagon with my giant example. Here are some folding instructions. 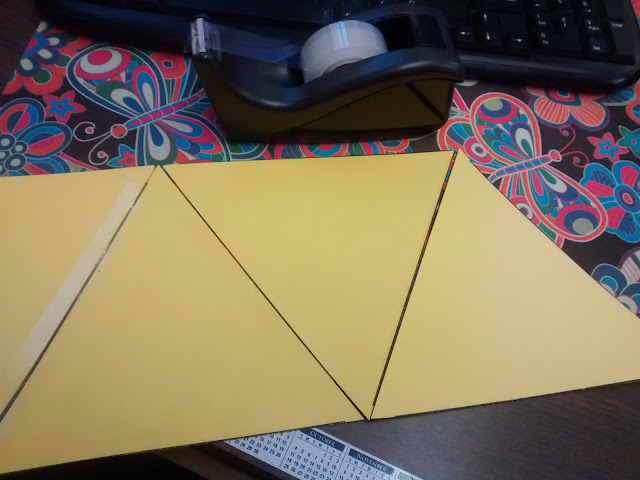 I explain how to fold it to students without any of the letters, but I'd suggest using the letters the first time you fold one and then finding a way to explain that makes sense to your students. After they are folded and glued, I show another Vi Hart video that has lots of super cool designs. Vi Hart actually has another video, but my students have always seemed to prefer the first and the third video. The second one gets a bit technical for them, especially since at this point they haven't even flexed a hexaflexagon! Here are some of their creations. 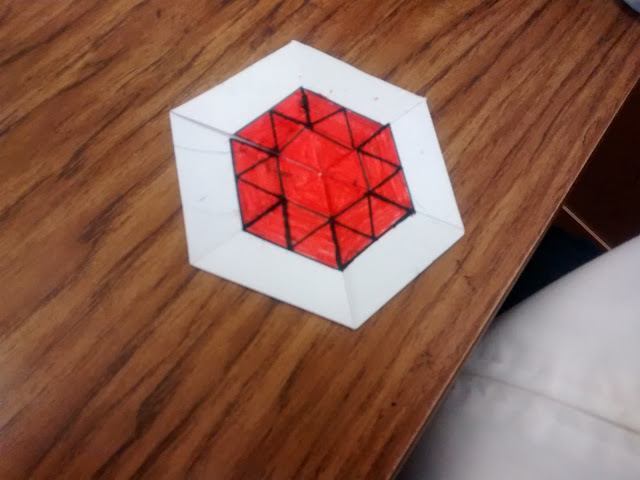 Some students finished early and were eager to try their hand at a hexahexaflexagon, too. I was also amazed by the number of students from previous years who still had their old hexaflexagon!